Take some time out these holidays to look at the works of the Australian Modernists. 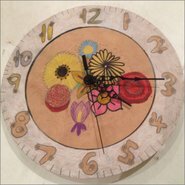 Create a colourful modernist design onto a clock face to take home and hang. All materials and mechanised clock hands included.